It’s the ballerina equivalent of a showdown. For 25 minutes and all three movements of Johannes Sebastian Bach’s “Concerto for Two Violins,” 11 dancers duel in perfect synchronization with the battling tones of the two baroque violins. Eight of the 11 dancers, dressed in pristine white leotards and skirts with their hair pulled back in sleek ballerina buns, make up the corps de ballet, though unlike the corps in many classical ballets, this group is not simply a backdrop for the soloists. Instead, they dance to the melody of one violin while three soloists dance to the melody of the other violin. 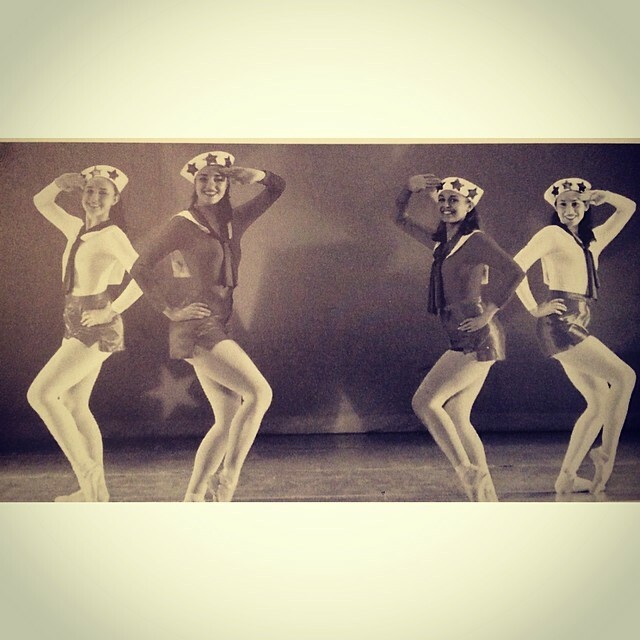 Flores (on the far left) and her fellow Concerto Barocco dancers. Every movement the dancers make, from the flick of their wrists to the slight turns of their heads to their dizzying pirouettes are simultaneous and paired perfectly with the nuances of the music. It’s almost as if the choreographer, George Balanchine, was trying to tell the story of two ballerina posses, dancing relentlessly to try and outdo each other. Though she doesn’t perform this ballet anymore, Flores still draws inspiration from the intricacies of Balanchine’s choreography, as well as other choreographers she has studied. But now she intertwines them with her love of art and literature and small inspirations from everyday life in New York City to choreograph pieces that display her light-hearted and creative personality. In the same way that oil paint and a blank canvas do not separately make a painting, the technical movements of ballet, like a pirouette or a grand jeté, do not make a dance. It takes another level of creativity to combine these movements and create a piece. For Flores, the process of making the movements of dance come together to tell a story comes naturally. Since she started taking dance classes at age 3, there was never a question in her mind about doing anything else. Originally from Austin, Texas, Flores moved to Houston when she was 14 years old to attend a performing arts high school where she focused on dance performance. She spent most of her time taking classes, doing ballet exams, rehearsals, and performances. It was here that she really started to appreciate the creative process that went into teaching and choreographing dance. Flores (on the far right) was a performer throughout high school and college. Flores wanted to move to New York after high school and attend the New School, but after it cancelled its program with the Joffrey Ballet School, she decided to attend the University of Oklahoma to get her MFA in Ballet Pedagogy. For a while she lived the life of a performer, touring with different ballet companies through China and France as well as through different states in the U.S. While she loved what she called the “life of the starving artist” she always preferred teaching and choreographing to the exhausting “eat, sleep, and dance” routine of a performer. After getting her degree and spending two years teaching and performing, Flores still had New York on her mind, and she eventually moved to the city seven years ago. She now lives in Manhattan with her boyfriend and her cat who is named after her favorite contemporary dance choreographer, Jiří Kylián. Besides dancing, teaching, and choreographing, Flores works as the program administrator at NYU Steinhardt’s Dance Education Program and she does education outreach with American Ballet Theater. Her years of studying and performing helped Flores to be able to juggle all of her responsibilities as well as think about the more creative aspect of dance. She relies on her knowledge of the dance vernacular and technique to put all the ingredients together for a dance that displays some sort of message–something she does daily when teaching her ballet and modern classes. Flores helping one of her beginning ballet students. 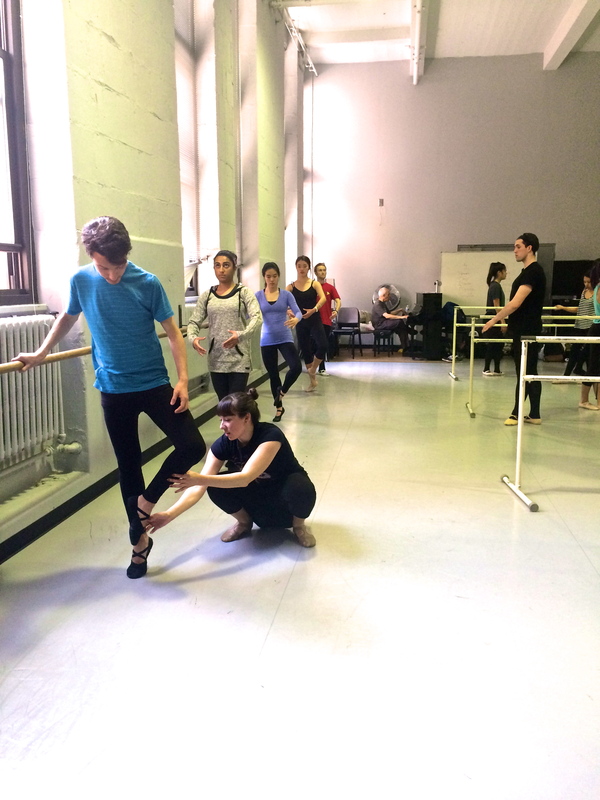 In Flores’ introduction to modern dance class for undergraduates at NYU she stresses the roles that art, literature, and music play in the creation of dance. In one lesson, Flores had pairs of students pick a piece of art—ranging from Michelangelo’s “The Creation of Adam” to Leonardo da Vinci’s “Mona Lisa” to some of Andy Warhol’s pop art—and then create a small dance inspired by that work. Even in her beginning ballet class, which is based more on technique, Flores finds a way to be creative with teaching precise and difficult movements. “She uses metaphors in the strangest ways. ‘Don’t be a pregnant frog’– I think that’s one of my favorites,” said Ally Han, a sophomore in beginning ballet, circling her arms in front of her body to demonstrate what Flores called the “pregnant frog” arm alignment versus the correct form. Though her extraordinarily good posture and always-moving arms exude the grace and poise of a dancer, Flores also has a light-hearted “kid-at-heart” way about her, which shows through not only when she uses funny metaphors or anecdotes to help her dance students remember what they’re learning, but also in the dances that she choreographs. Her work came full circle at the 2015 Distinguished Faculty Dance Concert at NYU, where Flores premiered a piece she choreographed called “Valse de Bourgogne.” From afar, the ingredients of her dance are very much the same as the ingredients that make up Balanchine’s “Concerto Barocco.” The ballerinas wore similar leotards and skirts, although in a rich red wine color instead of pure white, and their hair was pulled up in the same tight ballerina bun. The technical movements–turns, jumps, extensions–were the same as well. 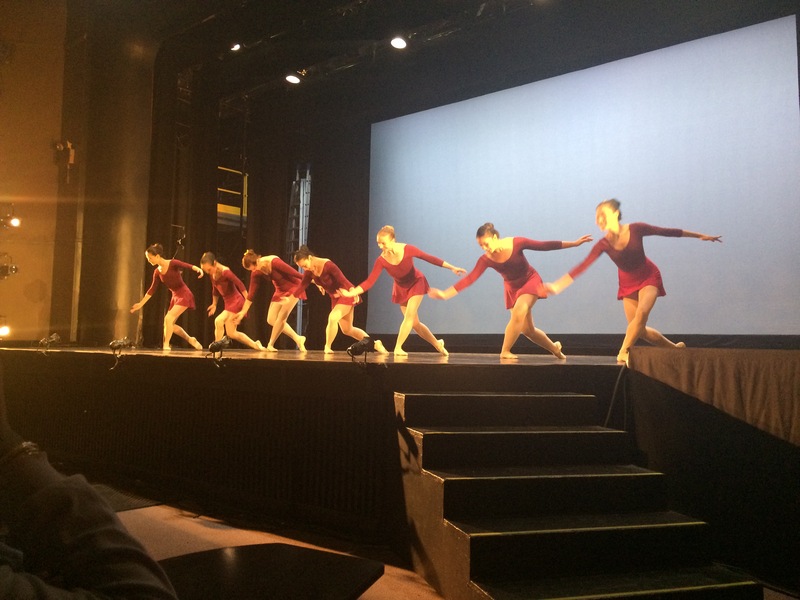 The dancers in Flores’ piece “Valse de Bourgogne” take a bow. While the piece was inspired by Balanchine, even using the same music that Balanchine used for his “Valse Fantasie” dance, the mood and the very essence of the dance feels completely different than that of Balanchine’s. The dancers float across stage in beats of three, along with the waltz of the music. Occasionally two dancers paired off for a duo while the rest posed majestically in the background. The fluidity of the dancers’ bodies echoes Flores’ other inspiration for the piece: Matisse’s painting “La Danse.” There is none of the aggression or dueling which shows through in Balanchine’s piece. Much like Flores, this ballet is lighter and more amiable. Through the effortless jumps and turns of the ballerinas on stage, Flores’ own personality shows, which is what makes this dance its own piece of art and demonstrates her transformation from being part of the painting to being the artist.